Schecter Guitars, or to give them their full name Schecter Guitar Research, was founded in 1976 by David Schecter. Originally the company only produced replacement parts for existing guitar manufacturers such as Fender and Gibson. However, they rapidly branched out and started to produce their own line of guitars and amps. This business proved highly successful and so Schecter has grown into the highly respected guitar manufacturer that we know today. This strong reputation can be seen in the rapidly growing number of guitarists who are starting to endorse the Schecter name. Bands such as Disturbed, Avenged Sevenfold, The Cure, Papa Roach and Seether all feature guitarists who endorse Schecter guitars. Never happy to rest on their laurels Schecter are always trying to innovate and push the limits of guitar design. For example they are well known for their 6 string guitars but they are rapidly becoming the guitar of choice if you want more than the standard 6 strings. Schecter produce both 7 and 8 string guitars but it is the six stringed Schecter Omen Extreme 6 guitar that we will look at today. Cut from mahogany the body has a quilted maple top which has been finished with a great looking see-through black lacquer. The deeply contoured double cut-away body allows fantastic access to the upper frets and the slim-line thin C style bolt on maple neck is a dream to play. Loaded with two Diamond Plus Humbuckers the Schecter Omen Extreme 6 has a great sound to match its looks. The Schecter Omen Extreme 6 comes with a tune-o-matic through body bridge, so if you are looking for a bit of whammy bar action this is not the guitar for you. 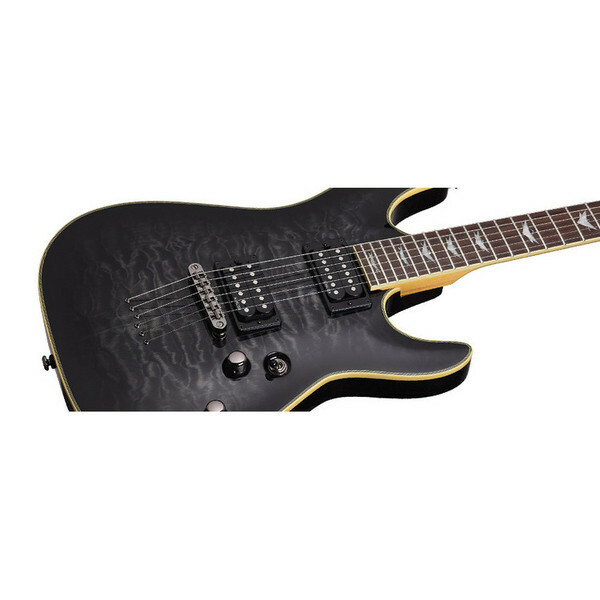 However, with the Schecter Diamond Plus humbucker pickups in the bridge and neck positions it is clear that this guitar is positioned to attract the hard rock/metal end of the market. The Diamond Plus Humbuckers feature over-wound coils and ceramic magnets which give these high output pickups, energy and push. The coil tap feature also allows you to switch to sparkling single coil, making the Schecter Omen Extreme 6 an incredibly versatile guitar. Plug the guitar into an amp and you feel the true effect of the Diamond Plus Humbuckers. There is a standard three way selector switch allowing you to access either the bridge, neck or both humbuckers together. There is a master volume and tone controls and throw in the coil tap you have a guitar that is really responsive. From clean tones to crunching overdrive the guitar can crank out a great sound which should keep most guitarists more than happy. The Schecter Omen Extreme 6 is a great guitar; it really looks fantastic and is very well built. I feel that the guitar has been designed to be a good all-rounder, the entry level Schecter guitar perhaps. If this is the aim then the Schecter Omen Extreme 6 certainly delivers. If you are looking for a mid range rock guitar which is incredibly versatile and looks the business then I think you could do a lot worse than take a look at this guitar. 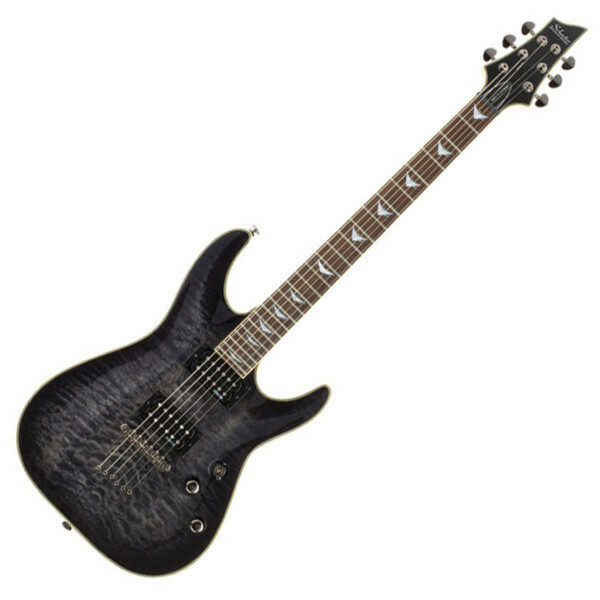 The Schecter Omen Extreme 6 normally retails for £349 but you can get it through Gear 4 Music for an amazing £319 which represents excellent value for a brilliant guitar. Body Mahogany with quilted maple top. Bridge Tune-o-matic through body bridge.